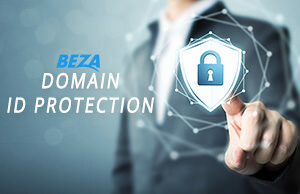 BEZA.NET Domain ID Protection provides solid protection against countless threats and annoyances. Use Domain ID Protection to protect your privacy. When you register a domain name, your name, address, email and phone number must be included in public WHOIS databases which are abused by spammers, marketing firms and online fraudsters. The Domain ID Protection was designed for domain owners who wish to protect their privacy and identity on the Internet. With Domain ID Protection enabled, your confidential information is no longer available for public consumption. Get Domain ID Protection for only $4.95/year. We’ll protect your information from public WHOIS databases by replacing your name, address, and phone number with our Domain Privacy info. This means your private information is never accessible to spammers, telemarketers, unsolicited phone calls and identity theft. ID Protection keeps your private email address from being displayed in the public WHOIS databases. E-mails are filtered by our E-mail Security Services to stop spam, phishing and viruses from reaching your private email address which remains secret. Domain ID Protection keeps your private phone number out of public WHOIS databases. Instead, we’ll display a BEZA.NET owned phone number which keeps unwanted callers from reaching your actual phone number. Domain ID Protection has you covered. Activate ID Protection on an existing domain name. For more info, please see FAQ below. What can Domain ID Protection do for me? Domain ID Protection replaces your name and contact information in public WHOIS databases. This protects your private information from being mined and used for other purposes, such as identity theft or unsolicited marketing. How can I activate Domain ID Protection? Can I disable Domain ID Protection if I need to? Yes, you can disable Domain ID protection at any time via your BEZA client portal and enable it back when you want to reactivate it. What happens to emails sent to ID Protection listed WHOIS email address? BEZA.NET Domain ID Protection service replaces your email address with a unique BEZA.NET owned email address. Anyone using the public WHOIS database to lookup your email address, will see the BEZA.NET owned email address. If an email is sent to this email address, it’s filtered for spam/phishing/viruses before we’ll forward it on to your private email address of your choice. The Internet Corporation for Assigned Names and Numbers (ICANN) broadly requires that the mailing address, phone number, and email address of those owning or administering a domain name are made publicly available through the “WHOIS” database. The WHOIS database allows you to instantly obtain information on a given domain name, including who registered it, when it was created, who to contact at that domain, and so on. What information is normally made public in WHOIS? Do I need to list my real information in the public database? ICANN requires that domain owners have true and accurate ownership details on file with the registry. They can even force registrars to suspend customer domains if there is inaccurate ownership information listed in the system, and as a domain owner, you are required to list true and accurate ownership details for any domains you register. However, this information stays hidden from the public when you have BEZA.NET Domain ID Protection enabled for that domain name. Is Domain ID Protection available for every Top-Level Domain? We wish it was but unfortunately not all TLD extensions are eligible for domain privacy. Each registry sets their own requirements for domain owners, and some do not allow domain owners to list anything but their own contact details. Our system will automatically offer you ID Protection for a new domain name which ID Protection is offered by the domain registry.